I like fiction and action books. 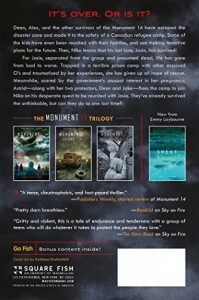 In the book "Savage Drift: by "Emmy Laybourne" there are a few survivors of a apparent disaster "Monument 14" and the names of these survivors are, Dean, Alex, Astrid, Niko, Jake, Sahalia, Chloe, Batiste, Max, Ulysses, Caroline, and Henry. These survivors made it to a refugee camp in Canada named Quilchena and now a few of them are looking for a girl named Josie, some of them think she might be dead or lost. Niko, is the one who is searching for josie and trying to find her everywere. While everyone is busy trying to find a way out of the government's eyes, Niko still worries about Josie but the group tells him that she is probably ok and there is no need to worry, they find out that Josie was taken under her will and they will have to work together to get Josie back. This book was a pretty good description of the apocalypse even though there is 3 books in total. I think that the book had a lot of plot twists but they were always interesting to imagine and read. A few questions i have for the Author or Book is, "How did you start with the apocalypse as the situation, and why was the trioligy always leave someone excited or curious. This was the first book i read about the trioligy and even though it was the first, i felt like i already knew everything about it. I would reccomend this book to people that have patience and enjoy different perspectives in the book about or from the characters. The book "Diary of a wimpy kid" by "Jeff Kinney" was a good Book because it has a lot of drama even though its a stick figure Picture Book. 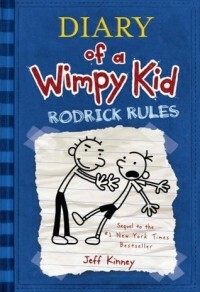 The Main Character in the book is named Greg and his brother is Rodrick. He and Rodrick don't get along that much but they care about each other. Greg's older brother Rodrick now knows two of Greg's biggest secrets. One, is that Greg has a diary, And the second, is the story about the kiss of death. The worst thing that can possibly happen to him is people knowing that he keeps a diary. In his Diary he has a lot of secrets that he has and even his most embarrassing stories. This book is filled with a lot of surprising twists and there is a big amount of things you can be sure of while reading it. But there is one thing that you can be sure of...there is no brotherly love between him and Rodrick. The Book "The Viper's Nest" was a really Good book for me to read. It had action, mystery and Adventure. I liked the book because i love reaading Action books and mystery books. 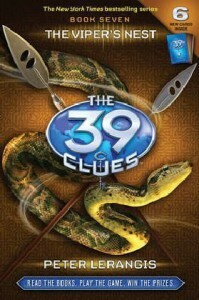 In the book there is a Girl named Amy and a boy named Dan, they find a hint in the notebook of a fallen competitor that leads to South Africa.Then, Shaka Zulu, historic leader of the Zulu nation, seems to be the key to this Clue, but Amy and Dan must break into a Tomas stronghold to get it. The two are close to the Clue when they discover classified information: Their parents were wanted by South African police for murder, wich they didn't commit. 2. It was Fun to read and to imagine the scenes of the book. Dramatic endings of a chapter or a cliff hanger. I would reccomend this book to anybody because its a good way to get your mind off things.